After a decade of decline, global hunger appears to be on the rise, signalling the urgent need for action. During a time of political change around the globe, this event is an opportunity for world leaders to make new pledges and commit to address the challenges in food and nutrition security. Building on the Nutrition for Growth Summit in London 2013 (which mobilised over $4 billion for nutrition-specific projects, and $19 billion in nutrition-sensitive projects), and the Nutrition event in Rio in 2016, the Global Nutrition Summit 2017 held in Milan, on Saturday 4th November 2017, fostered dialogue around sustainable food systems, gender and health, and the role of urbanisation. Organised by the Food and Agriculture Organization, the UK Department of International Development, and the Gates Foundation, in collaboration with the Global Panel and the Global Alliance for Improved Nutrition (GAIN), this session set out why and how food systems need to work better for nutrition, highlighting promising models for commitment, and actions that governments and businesses need to take in order to deliver healthier diets. Mr Kofi Annan, former UN Secretary General & Chair, The Elders, opened the session with keynote remarks. Dr. Lawrence Haddad, Executive Director, GAIN, and Chair of the Global Panel Foresight Leading Expert Group, drew on the Foresight report to highlight the need for action to address malnutrition and low-quality diets through a food system approach. 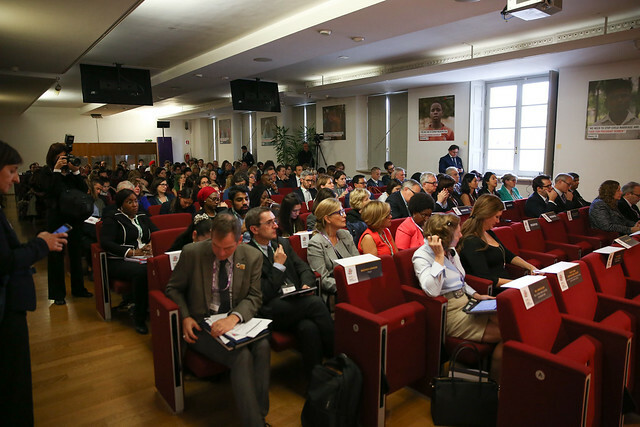 The panel discussion that followed highlighted promising models for commitment and actions by governments and businesses in support of nutrition-smart food systems. Anna Lartey, Director Nutrition, FAO, and Global Panel Representative. Lord Michael Bates, Minister of State, International Development, DFID. Tobias Wasmuht, Head of Marketing & Retail, SPAR. Eric Muraguri, Managing Director, Chicken Choice, Kenya. This session highlighted the strategic and innovative role cities and their stakeholders can play to address nutrition needs. It showed how recent decades have seen unprecedented population growth in urban areas, where 66% of the world’s population is projected to be living in cities by 2050. This is leading to a growing crisis of urban malnutrition where overweight and obesity, undernutrition and micronutrient deficiencies co-exist. Without decisive action, this nutrition crisis will deepen in response to multiple pressures such as globalization, migration, population growth, income inequality, pressures on land and water for food production, and climate change. Drawing on the findings of the recently published brief “Urban diets and nutrition: trends, challenges, and opportunities for policy action”, Panel Member Tom Arnold, former Director General of the Institute of International and European Affairs (IIEA), provided an overview of the growing challenge of malnutrition in urban areas, and presented opportunities for action, particularly by local governments, the food & beverage industry, and agribusiness. Wayne Roberts,Canadian food policy analyst and writer. Jane Battersby, urban geographer and Research Coordinator of the ACC’s Consuming Urban Poverty Project. Anna Scavuzzo, Deputy Mayor of the City of Milan and Chief Councilor for Education. Albert Anda Ntsodo, Member of the Executive Mayoral Committee and Mayor’s Representative. The summit convened government representatives, foundations, business leaders, international agencies, and civil society organizations. They discussed the Global Nutrition Report, and how ending malnutrition in all its forms will contribute to all of the U.N. Sustainable Development Goals. Donors announced $3.4 billion in funding, including $640 million in new commitments, to advance the global response to malnutrition.